My new book, Math on the Move: Engaging Students in Whole Body Learning is ready for preorder! Find out more here. I missed having a blog, so I made another!! You can find me here. More info on my other spaces below. Cheers. The time has come to say goodbye...to this blog. 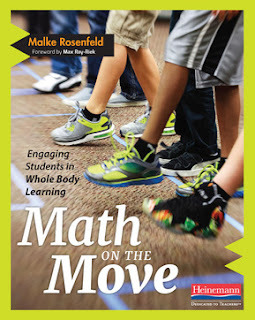 In the last month not only was my first book published but I also handed in a 70,000 word manuscript to Heinemann which will be transformed into a book with an online video companion by fall. Where will I be? For now you can find me at malkerosenfeld.com or mathinyourfeet.com. I'm also on Google+, Facebook or Twitter. You can also subscribe to my mailing list for notifications about book related events and opportunities for educator workshops. My first new book of 2016 is out and it's gorgeous! Do you want your students and children to feel like algebra is beautiful, playful, and intuitive? Come play, solve and make math with us! 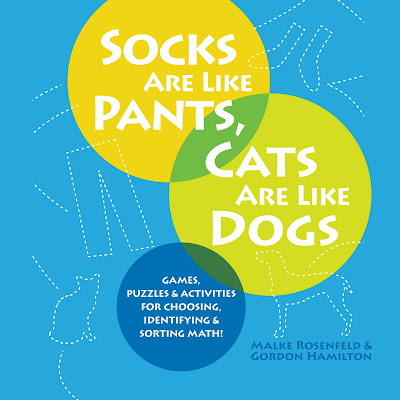 Our new book is filled with a diverse collection of math games, puzzles, and activities exploring the mathematics of choosing, identifying and sorting. Teachers and parents have tested all activities in classrooms and living rooms. The activities are easy to start and require little preparation.